Lakefront Cabin. Private Floating Dock. Great location. Great water front location, with your own dock space for your boat or jet ski. Cabin is located near the famous chucks marina where you can enjoy the lake's only karaoke bar, the best pizza and tons of fun. Enjoy all the water activity you can handle plus a ton of fishing. Activities your entire family will enjoy. Sit around the lakefront deck and enjoy the gorgious afternoon sunsets. A swing is located on the lower patio for your enjoyment. Water, sun, sunset will all leed to an unforgettable vacation. This cabin is stocked with all upscale ammenities and all the necessities that you need away from home. Just bring your clothes and you'll be all set. Best prices are for those who book early. Please email or call anytime. You are just a phone call away from making your dream vacation with the family come true. Pets are welcome but are evaluated on a case by case basis and generally depend on the size of your companion. All renters MUST disclose pets to owner and having pets will require additional fees and/or deposits. Lake view does exist but a bit obscured in season because of trees that grow leaves directly on the Lake side of the cabin. However, its there. Our cabin sits on 75 feet of water front. Directly across from Chucks Marina. Perfect location. Stainless steel appliances. Jenn Air convection oven. Property has 2 levels and is located on an incline. Wont be able to maneuver a wheelchair easily. Property was pretty nice but in need of a good deep cleaning , maintenance and furniture update. The gas grill was great! While we were there 2 days pressure washers were going cleaning the mast green moldy walk ways that go down to the water. Glad they were getting cleaned but very noisy for us. All in all we had a good holiday but I feel the property did.not deliver what was advertised. The owner did respond quickly to my questions. Certainly appreciate the review. We will correct the various issues immediately and definitely take into consideration everything else that was recommended. Beautiful cabin located right on the water! We enjoyed our stay! Enjoyed working with you and happy to have you stay with us again soon. Property was clean, extremely well appointed, stocked with amenities, and excellent location. This was our second family trip to Lake Martin and this cabin did not disappoint. We traveled with our two boys (ages 8&10) who loved the bunks. The master bed was very comfortable. Living area and kitchen were modern, clean, and very well appointed. The owner, Matt, is extremely helpful and quick to respond to any inquiries- before, during, and after our stay. Great to work with! We rented a boat and loved our time on the water and this cabin was the icing on the cake. Highly recommend. Thank you for our kind words. We try to provide a great experience for all of our tenants. See you again soon. We’re happy that your family enjoyed it. Look forward to next time. This cabin is an outstanding place to stay. It is nicely furnished. The owner, Matt, is great! He quickly responds to your questions. We’re pleased that you had a great time. Look forward to seeing you again for another stay with us. The famous Chucks Marina is just minutes walking distance away so you do not have to worry about driving back should you choose to spend some time at Chucks enjoying live music, karaoke or some of the best pizza on Lake Martin. Shopping and football games are in Auburn and is an approximate 25 minute drive. 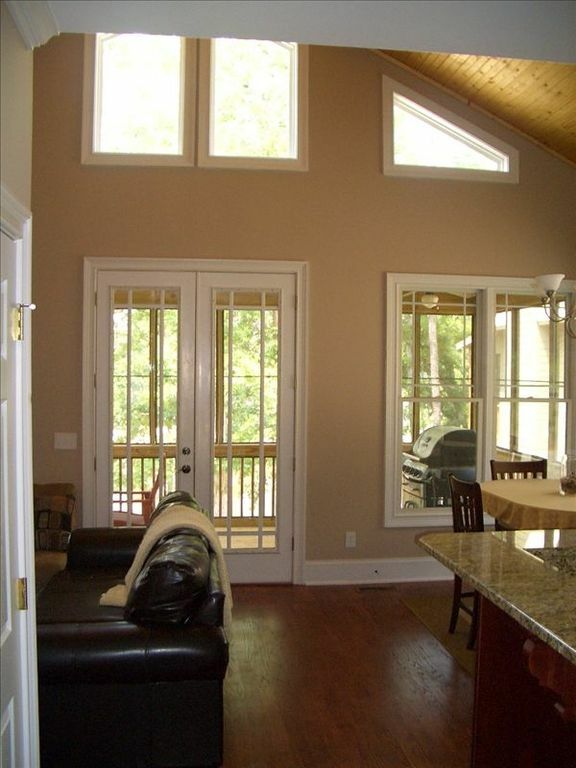 The cabin is convenient to Birmingham, Montagomery,Mobile and Atlanta. Its the perfect place as well if you want to visit Talladega race way to catch a race. All long term OFF SEASON rates are negotiable. Off season nightly rates does not include holidays.